The nebulosity around gamma Cassiopeiae is a faint collection of emission and reflection stuff - of which IC63 is only one secion. I've given it a long integration with the 6nm Ha filter on the 8 inch newtonian. The target transits about 3.40am local time, and my mount will track for an hour past this before getting close to pier-collision. Some differential flexure has crept in somewhere, which kept me to 500s exposures. Around 23:30 I set up on the target, and went to bed for a few hours, setting the alarm clock for 4.15am - when I awoke to switch things off and close the roof. Reviewing the files, I add about 30mins of clouds but quite a few good frames! I also got a glance of Mars and Orion in the morning twilight. This is a fine imaging method and strongly recommended when the rain radar looks empty. 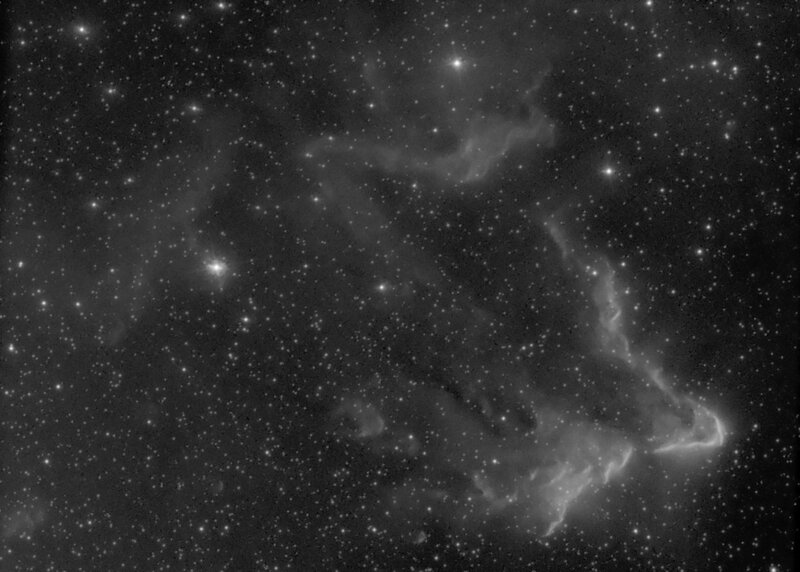 I've tried to work the processing to show up the interesting faint structure without making it look too silly. It is a difficult one to process - but I can't put my finger on why. As usual with deep Ha data, the more you push it, the more interesting features you find, and thus the further you are inclined to go - and then you look back at it later and realise it is a complete mess! Sometimes I think I should do two versions, one with all the faint stuff showing, and one a little more "relaxed". When entering the details for this image into my database, I was suprised to notice I'd already imaged this target almost two years ago. Look here for my attempt with an SC3 webcam and a CLS filter. Image at full size... but does work so well? Data from 25th and 26th. Captured in ArtemisCapture, calibrated in ImagetoolsCa, combined in maxim, thuggery in photoshop. Total integration time 6.8 hours. This image was autoguided using my 400mm focal length refractor and my black and white SC1 webcam.